لا للمحاكمات العسكرية للمدنيين: بيان صحفى من مجموعة لا للمحاكمات العسكرية للمدنيين بخصوص موقف المجموعة من الممارسات القمعية ضد حرية الرأى و انتهاك حقوق أعضاء المجموعة. بيان صحفى من مجموعة لا للمحاكمات العسكرية للمدنيين بخصوص موقف المجموعة من الممارسات القمعية ضد حرية الرأى و انتهاك حقوق أعضاء المجموعة. تعلن مجموعة لا للمحاكمات العسكرية للمدنيين انها بالرغم من حملة الهجوم الشرسة عليها و أعمال الخطف و التعدي علي اعضائها انها مازالت مستمرة ضد المحاكمات العسكرية للمدنيين و المحاكمات الاستثنائية الغير دستوريه و ان عملنا قائم طالما أنه مازال هناك ظلم يقع على المدنيين من المصريين والذى وصل الى ان عُرض ما يزيد عن 12000 مواطن مصري مدنى امام المحاكم العسكرية و المحاكم الاستثنائية مثل محكمة امن الدولة العليا طوارئ. كما تندد مجموعة لا للمحاكمات العسكرية للمدنيين بالضغوط التي مورست على إدارة مدرسة سان جابرييل بالاسكندرية بسبب إقامة الندوة الخاصة بالمجموعة "مصر الثوره تحت حكم العسكر" يوم الخميس 5 يناير 2012 بمسرح المدرسة، و ذلك بعد تهديدات بإتخاذ اجراءات قانونية من الإدارة التعليمية بسبب استضافة المجموعه، رغم أنها ليست المرة الأولى التي تعقد فيها المجموعة ندوة بمسرح المدرسة!! في حين أن المدرسة كانت تتيح المسرح كمكان للندوات التثقيفية والمناقشات السياسية المفتوحة إيمانا من إدارتها الواعية بحرية التعبير, وحرصا منا على ألا تقع إدارة المدرسة في مشاكل قانونية بسبب تلك الضغوط، قررنا تغيير مكان الندوة. و تعلن المجموعه ان كل حملات الهجوم عليها و على أعضائها و خطفهم تزيدهم إيمانا بالقضية و تدفعهم الي الاستمرار في هذه الحملة حتي الإفراج عن كافة المعتقلين و محاكمتهم امام محاكم مدنية طبيعية. و كما ترفض المجموعة حملات أقتحام المقرات و الهجوم و التشويه التي يشنها المجلس العسكري علي المنظمات الحقوقية، و ستقف دائما امام كل من يحاول ان يتجاهل وجود ثورة في مصر تنادي بالحرية. Press release published by “No to military trials for civilians “ group stating the group’s position as regards the repressive practices against the freedom of opinion and against the violation of the rights of its members . The “No to military trials for civilians group” declares that despite the fierce campaign launched against them and the acts of kidnapping and assault directed against its members, it will nevertheless persist in its efforts against the military trials of civilians and all unconstitutional exceptional trials. It also states that their work will continue as long as there is injustice bearing still on the Egyptian civilians, which has extended to an excess of 12,000 Egyptian citizen standing trial in front of military courts and exceptional ones, such as the emergency Supreme State Security court. The “No to military trials for civilians group” also denounces all forms of pressure exerted on the management of San Gabriel school in Alexandria to stop the symposium set to be held there under the title : " Revolutionary Egypt under military rule" on Thursday, January 5th , 2012 in the school’s theater , following threats of legal action posed by the Department of Education due to hosting the group, despite the fact that this is not the first time the group will hold a symposium in the school’s theatre !! Furthermore and in spite of the fact that the school due to the enlightened management’s belief in freedom of expression offers its theater as a set for educational symposiums and open political discussions, we however would not put the school management in danger of legal action threatened by these pressures and as such we have decided to change the venue of the symposium. This is not the first time pressure was exerted to cancel the symposium as another symposium was scheduled to be held at the " Goethe Institute in Cairo under the title "Tweet symposium” on Wednesday, January 4th , 2012 , and similarly the venue was changed for the same reasons and threats which calls into question, that meanwhile in the same time frame ,there is total availability of all venues in Egypt to express opinions favorable to the junta and its policies, without being harassed or threats made against the security and safety of the place mentioned. Wherever is the freedom of expression and security for those who have a different opinion? The group declares that all the campaigns and attacks on its members and their kidnappings only increases their faith and motivation to continue this campaign until the release of all detainees and granting them fair trials in front of ordinary civilian courts . 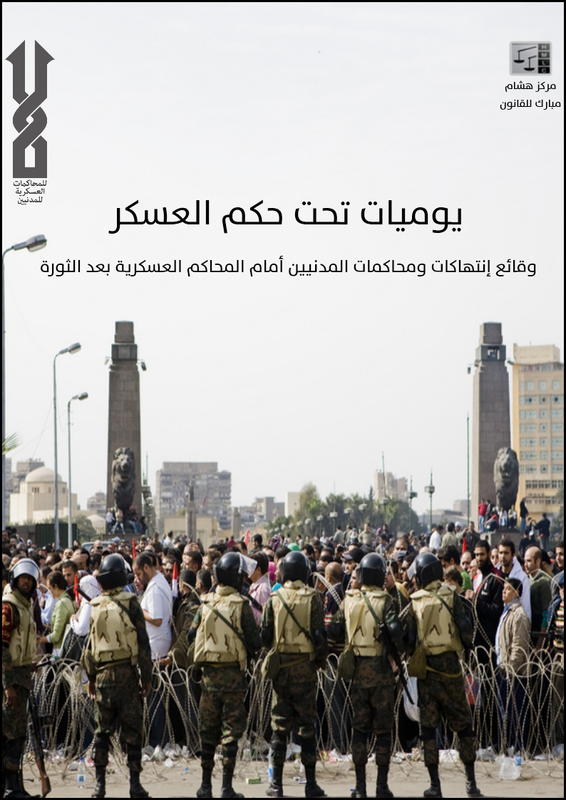 The group likewise refuses all campaigns involving storming the headquarters and locations of human rights organizations , as well as the smear and distortion attacks launched by the JUNTA against these organizations , and we will always stand against anyone who tries to ignore the existence of a revolution calling and striving for freedom in Egypt .